Without a doubt, the release of ultra-fast M.2 NVMe PCIe SSD drives has played a huge role in not only the IT world as a whole, but also in the photography community, where more and more photographers are choosing to build their own machines in order to speed up their photography workflow. Using M.2 NVMe drives for storing Lightroom catalogs, RAW files and cached data can speed up performance considerably, which is why many photographers, including myself, have been choosing these drives for our needs. However, after using M.2 NVMe SSD drives in my PC builds, I realized that they come with overheating problems, which can potentially lead to more frequent failures than hard drives or standard SSD drives. Having seen a couple of M.2 drive failures in the past few years, and having recently experienced a complete drive failure myself in a build that is less than two years old, I wanted to warn our readers about use of these drives in their environments. Let’s take a look at what causes these drives to fail and how you can keep your data safe. Having spent most of my life in the IT world, I know one thing for sure – excessive heat in electronics is never a good thing, especially when it comes to storage. To put it simply, cooling electronics is essential in order to keep them running longer. With the modern NVMe drives in small M.2 form factor, manufacturers are not making it clear enough that their drives must be properly cooled. With modern motherboards providing M.2 slots for these blazing fast drives, many PC builders are using their motherboards to host M.2 NVMe SSD drives, often putting them in areas that receive little to no cooling. And if the computer case is full of equipment, there is a likelihood that peripherals that produce a lot of heat (such as video cards) will raise the ambient temperature even higher, leading to more M.2 storage hardware failures. In fact, considering how hot these things get, manufacturers should be providing proper heat sinks, with specific instructions to keep them nice and cool. The most that I have seen done is by Samsung, which puts an aluminum sticker on its NVMe M.2 drives to spread some of the heat. What’s crazy, is that you are not supposed to remove the sticker, or it will void the warranty. This means that removing the sticker and installing a heat sink for cooling the device is not really an option for most people who want to be able to maintain that 3 to 5 year warranty. 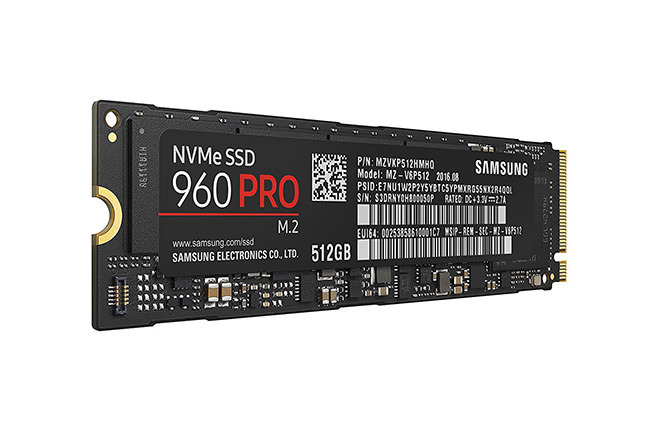 To keep the heat under control, Samsung and other manufacturers came up with ways to throttle the performance of M.2 NVMe SSD drives, which can reduce their performance enormously, stripping away their primary appeal as ultra-fast storage devices. I found out about the heating issues before buying my first M.2 NVMe PCIe SSD drive (which was the 512 GB Samsung 950 Pro). I purchased it with a heat sink, but after some consideration, I decided against removing the label and voiding the warranty. Instead, I went ahead and placed my unit in an open area of my large tower case with good airflow, making sure that air from my case fan directly reaches the unit and cools it off. The device worked well, but under heavy loads it would still heat up and throttle. To reduce the chance of any potential failure and resulting data loss, I decided to only store my operating system on the drive and use it for caching and my Lightroom catalogs, which get frequently backed up anyway. I did the same with two other M.2 NVMe PCIe SSD drives, although they were the newer Samsung 960 Pro versions. One of the drives failed after about 20 months, resulting in total data loss. Aside from baking my drive in an oven (believe it or not, but that method does work in some cases), I tried a number of different tricks to revitalize it, but to no avail. The hard drive light lit up each time anything tried to access the drive and it would go on and off for hours. Since I had another 3 years of warranty on the device, I decided to send it in and just get it replaced, as I didn’t care for the data I lost on it. However, it did leave a bad taste in the mouth, and I thought about how horrible it would have been to lose data, if it had not been backed up. There are plenty of data recovery options for spinning drives – labs that specialize in hard drive data recovery and they can often do it at reasonable costs (as little as $300 per drive). But recovering data from these new SSD drives is going to cost you, since not many labs even have the right equipment to be able to do it. This is why backing up your data is critical! If you decide to use any SSD drives in your computer build (and you should, since they are extremely fast), no matter what form factor, you should plan for a very thorough and working backup solution. You must make it an essential part of your workflow – that’s how critical it is. I often come across photographers who only use their laptops for their post-processing needs, and it is shocking to see how many photographers out there never back anything up and only store their catalogs and photos on the same drive (which is often an SSD drive). SSD drives are more reliable than spinning drives in the long run and they might not get damaged when they are dropped, but it does not mean that they are fail-safe. Another good lesson I learned from my IT career: every type of storage fails, it is just a matter of time! Don’t be fooled into thinking that your SSD drive will never fail you – always back up your data, and make sure to back up often. If you cannot commit to a proper backup routine for any reason, simply avoid storing any critical data on M.2 NVMe SSD drives. Keep your RAW files in a dedicated external storage array, such as the Synology DS1817+ or a QNAP TVS-882T and automate your backup process by dumping data on another external drive from those storage arrays directly (very easy and quick to set up). If those are too expensive for your needs, you can buy smaller and cheaper storage solutions that will not only address your immediate storage needs, but also protect you from losing data in the future. That’s what I do, and after experiencing the overheating issues pointed out above, I decided to follow the same methodology on all computers I have in my environment. Lastly, please don’t assume that a RAID array, such as RAID 5 or RAID 6, is a backup of your data! Losing a RAID volume due to power failures, multiple drive failures and other hardware-related failures can be very painful and can cost thousands of dollars to recover. Always make sure to follow the 3-2-1 backup rule, as highlighted in my Photography Backup Workflow article. KISS. Simple is better. Three completely independent, inexpensive high capacity “spinning” drives is all that most photographers need to store photo files. ASSUME that eventually they will fail. Every two or three years replace the oldest one, transferring its contents to a new one. (or keep it if you prefer…then you’d have four or more). I worked in IT too. The high end drives in RAID arrays fail too. External backup is the key. One benefit of an offline backup volume is the malware infection. I’ve seen these encryption malware destroy everything it can see. This includes backup datasets on servers, or anything where the workstation has Write rights. My drive replacement criteria for my commercial (server) clients is 26,280 hours or 3 years of 24×7 operation. Regular audits with Crystal Disk Info or other SMART utility will show the error counters and hours. Some people use their old camera storage cards as the storage medium. My gut tells me “no thanks” for this… any more than I would trust a USB thumb drive for long term storage. I agree that external backup is important. One way to protect against malware is to dump data and cycle hard drives, so that older data is stored offline. One can establish a rotation routine with a minimum of 2 drives, which works well. Again, 3-2-1 backup is the way to go. Phil, I agree simple is better, but I cannot imagine going back to manual backups. For one, many photographers out there end up not doing backups, so the more automation, the better. Also, if a backup process is automated, it makes a very consistent process, so that backups are performed on schedule. Unlike manual backups that often don’t end up taking place because one is traveling, sick, forgetful, etc. Also, for many photographers, including myself, one drive does not suffice to keep all the data, so we must rely on 2+ drives in an array. This complicates things a bit, but it is not too big of a hassle once things are automated. RAID drives also fail, which is why I warned in the article against treating RAID as a backup. I have been running with 2 levels of back-up for years. Both automatically watch for changes in files (add, deletes, new revisions) and back up accordingly. One is an external drive, the other a raid NAS. Recently i’be taken advantage of Amazon’s backup service that is part of the Prime membership and adding a 3rd level of backup just for my images. All this this came in handy, first when I lost my main drive due to failure, and second when I decided to upgrade to a new computer. Backup early and often – at some point something will fail! Wrt m2 drives I only store program files (no data other than cache) on them. Haven’t seen any issues but I have a Lenovo that I assume was designed with the proper cooling. The fan has gone into high gear when processing videos (really loud!) but don’t know if that’s CPU-heat related, memory, or both. Barry, thanks for sharing. Personally, I don’t see much value for cloud storage except for those who have very few images to back up. I sometimes come back with 20 GB of data. Trying to get that uploaded over cable network with less than 2 Mbit upload speed is going to be a nightmare! Last time Spencer was in my house he had Backblaze automatically kick in and start uploading images from the 3 days of shooting together. He brought my entire network to a halt very quickly. Cloud storage is great for fast networks, but it is completely useless for home environments. Currently I’m using two way of backing up my data. The first one by using the external hard drive (yes I know that it is not that reliable but at least there is a backup). The second one I’m using those free cloud storage. Since the cloud are limited storage, I only store critical with small size data there. Thanks for the info/tips above. Mohamad, small data would work fine for cloud storage and I use it too (Dropbox, Google Drive, etc), but not for storing large RAW files. For that, the traditional backup using hard drives is the best way to go. Nice to read but how does it work for only gaming only? John, I don’t game, but based on what I know, M.2 drives are extremely fast and allow anything to load quickly, including games. You have worried me a bit. I used an M.2 when I built my husband’s computer. It doesn’t have the NVMe in its name, but just the plain M.2 (Samsung 850 EVO M.2). Would this have the same overheating issues as the M.2 NVMe? His computer does not get heavy usage to make it run hot. Your M.2 drive is a Sata drive. They are not as fast as NVMe but do also get quite hot. My motherboard temp readings are quite high unless my case fans are running at 1000rpm. Invest in some good case fans and make sure the airflow is good. Also check regularly for dust build up. Elaine, M.2 is a form factor and you can have both PCIe NVMe and regular SATA drives on them. As Andy has noted, your Samsung 850 EVO is a SATA drive, so it does not offer the same level of performance as the drives pointed out in the article. Still though, even SATA drives in M.2 form factor can get pretty hot – I would encourage you to back up often. I’ve been using Samsung 950 and 960 (both Pro and EVO) NVMe drives in my own computers and customer computers for several years. Probably have about 70 or 80 of them out there? None of them have failed yet. I only deal with custom built computers though and plenty of air flow, such as Sager laptops and good cases like EVGA, Antec, Fractal Design, etc. with Noctua fans. Maybe the higher quality components and cooling have made me lucky so far. Many are liquid cooled CPUs and GPUs with exhaust radiators, so that would cut down on case temperature too. My case is usually 3-5°C above ambient temp, even under heavy load. Aaron, that’s all I use in my builds too – Samsung 950 and 960 series NVMe M.2 drives. I also thought they were pretty darn reliable until I personally experienced a failure and seen a friend go through two 960-series EVO drives in less than a year. I cannot pinpoint the reason why mine failed – I had it sitting on a large desktop with 4x Noctua fans, one case fan blowing air directly on the unit. It would still get pretty damn hot though! On the day it failed, the computer booted up fine, but had Windows stuck on the login screen, with no login prompt. I let it sit for a while, and then ended up resetting the computer. From there, it was completely dead, showing the HDD lamp going on and off infinitely. Having never experienced any SSD failures in the past, it was a surprise, especially given the age of the unit. This is very surprising. Anything can fail of course, but my experience has been that they are one of the most reliable components to a system, right up there with CPUs. Very strange indeed! It turns out SSDs like to be operated at 40 degrees C or over – it in fact makes any data written persist longer. An SSD written at 40 deg and left off at 25 deg will hold data for 1 year. But if the data was written at a nice cool 25 deg, it would only persist for half a year (if never powered up during that time). SSDs will not store data long term. (Use a hard-drive for that!) It needs to be refreshed electronically regularly. While they’re running the device is continually refreshing blocks – even the data that they computer is not changing. If you unplug them, the bits will slowly fade and eventually become unreadable. Conversely, while SSDs are unpowered, they like to be left cool. The heat that helps “writes & refreshes” operate more deeply also accelerates the “data rot” when not plugged in. Let an SSD sit in the sun and warm to 55deg? That data will only last ONE WEEK. Putting that SSD in the over might have had a chance of fixing a mechanical problem, like fixing a cracked solder connection between components, but it is also a good way to wipe the data on it. Advice about backing up important data is very true – things like a power cut or pulling the plug unexpectedly can also cause havoc on an SSD, maybe not just to files part way through being written – but also to any other files sharing the same “blocks”. Although usually it’s still a pretty limited amount of damage compared to a complete device failure, which I’m sorry to hear you had. Thanks for pointing it out Luke. I think heat is pretty relative here – it is one thing to operate a unit at 40 degrees (warm, but not hot) and completely different when heat is pushed to the level where the unit itself starts to throttle. The article you referenced refers to traditional SSD drives, but not the new M.2 kind that tends to overheat under heavy load very quickly. Good info here. I’ve built my own systems, with a few exceptions, ever since the late 80’s. This lets me install what I can afford and what I need/want. I am currently running my Windows 10 Pro OS on a Samsung 960 EVO Series – 1TB PCIe NVMe – M.2. I built the new system with this drive as the C: drive in January of this year (2018). Runs fast and by putting my Lightroom catalogs on this drive, it is quite responsive. My pictures folder currently holds 55,000 files and is 1TB in size. I have several other spinning hard drives of 2TB and 3TB capacity both internal and external. I created a mirrored drive internally using two, 3TB drives. This is where I keep all my photos. Using a RAID setup like this provides safety for when one of the mirrored drives fails. And it has and will happen, although it’s been a year or so since my last drive failed. I backup using WIndows Backup from the Control Panel and I do an additional backup using Norton 360 backup. I keep these backups on separate drives. So far so good. I’m glad to answer any questions from those posting here. Dave, thanks for sharing! Backing up is indeed critical and something we should always not forget about. Only issue I take with the article is you’re illustrating the most robust, heat proof drive on the market as you’re pictorial example. If you’re burning out 9×0 pros, it’s user error and hardware abuse. There have been independent tests galore showing industry leading reliablility across clusters of hundreds of drives at peak I/o loads. Anandtech has periodic heat concentration flir mapsfor the same. I personally have had a 2x raid 10 array with crunching full-time on sequencing for 3 years with no issue. You’re either not using samsung drives, or you’re doing it wrong, which seems common among photogs/videographers/creatives. Kay, the reason why I have the picture of a Samsung M.2 is because that’s exactly the kind that has failed – I only use Samsung M.2 drives and that’s what I recommend to everyone, because those are the fastest and the most reliable M.2 drives on the market. I also did not expect to see these things fail, but they do more often than what I would like to see. A friend has gone through two M.2 EVO units and my 950 Pro failed in a relatively short period of time too. Both of us build our own computers and mine was sitting in a large tower with plenty of airflow. My friend’s computer did not have proper airflow (a very small form factor desktop with everything crammed inside) and I believe heat was the reason that killed his. So I do agree with you partially that there is hardware abuse to keep in mind for some of the builds that fail out there. Still, it does not change the fact that M.2 NVMe drives overheat very quickly and run at much higher temperatures than standard spinning drives and SATA SSD drives. Look up overheating issues with M.2 drives on Google – you will find plenty of other examples of overheating and hardware failures. I place Samsung SSD with all my clients. The system volume is Samsung SSD, and the data volumes are RAID1 rotating disks, 7200 rpm Caviar Black. #1 – SSD should NOT be used in any type of RAID environment. Been there, done that, paid for that mistake. #2 – SSD should be used for the operating system volume, not data volumes. Unlike rotating disks, SSD have a finite number of write cycles. A huge photo workload, temp files, etc can exceed the write count. Those using SSD are encouraged to leave 10% of the disk in a raw/unformatted state. These are spare cells that Samsung uses to replace those with a high wear level. Those wanting faster performance: install a LOT of RAM. This is very expensive. About $1k for 64gb of DDR4. My PS6EE would probably use 128gb for my large panoramas. I have 32gb, temp files on a rotating Caviar Black, and 850 PRO for my system volume. If your drives are overheating, it because M2 pushes a faster data rate than SATA channels. Add cooling. If you let it run hot by pushing it hard, it WILL fail. I have used Samsung SATA SSD drives for many years now and I disagree with your observations. Standard SSD drives can be used in RAID environments, as long as they are properly backed up. I have done RAID 0 arrays with SSD drives in the past, when I wanted to have one large volume and the prices of large-capacity SSD drives were very high. I also currently use SSD drives as data volumes for doing photo and video editing, but again, I always make sure to back them up frequently. However, things are different with M.2 NVMe SSD drives – those things get very hot, much hotter than SATA SSD drives, so I would not use them to store important data without a proper backup routine. Your use of SSD in RAID arrays is in direct conflict with Samsung’s specific statement about ‘not for RAID use’. I’ve spent my entire career as a full time IT professional in Fortune 50 environments. The manufacturers have valid reasons when they make these statements. Perhaps you have used Samsung SSD in RAID configurations without problems. Not everybody who smokes will get lung cancer, but doing so is still risky. My experiences with Samsung SSD in RAID1 is one of the volumes failing and being marked offline. I too, thought I was smarter than Samsung’s recommendations of “no for RAID use” but I found out otherwise. Hard disk storage space is cheap. Especially when thought of in lost-data terms. Every internet-connected photo workstation is exposed to malware and Cryptowall-type ransomware encryption. The ransom starts at $750 for the first 3 days, $1500 for the next three. Nothing after that. The last Cryptowall bug I worked came in email disguised as a resume. It burned the client to the ground. Those making their full time living from photo work should have their photo workstation permanently disconnected from the internet. I’ve been doing SATA SSD RAID with Samsung 8xx Pros for many years, no issues. NVMe RAID isn’t much benefit until VROC is sorted (right now it’s Intel branded SSDs only). As with anything, back up daily at a minimum, with weekly offsite. Everyone in the comments are talking about cloud storage as a backup. Let me make this clear: Dropbox, Google Drive, etc., are file SYNCING services, not a backup. A proper backup service keeps file version history and allows you to restore to a specific point in time. If a file gets corrupted on your system and that corruption is synced, then you won’t be able to restore that file. Nightman, it depends on the cloud storage. If a file is overwritten, some cloud services can preserve version history and allow you to restore a file to its previous state. But I agree in general with your statement – best to keep a real backup than to only have a syncing cloud service. Ideally, have both. Note on removing stickers sounds the warranty. Recently federal authorities have said this is against federal law. Removing stickers or replacing heatsyncs will not void warranties. Google it. Removing the label WILL void you warranty. I’ve added my heatsinks (which were designed for a raspberry Pi) on top of the label without any issue. The label is made of copper better transfer heat. Photography and over heating some computing hardware….. hmmm…. sometimes we got to take a step back. Do we need 100MP while any of the Masters like Bresson, Newman, McCurry work are equally stunning viewed at 1280×800 pixels? Flip the books of the masters, count your favorite images from these books, they could easily fit in a 4G thumb drive. 1280 x 800 pixels (for 3 x 2 it should be 1200 x 800) is far too little for printing in most cases or viewing on monitors which are up to 4-5 k. I have some old images from a Coolpix 950 which are 1600 x 1200 and I think they are a little too small for my current monitor which is 2736 x 1824. Have you ever been to a McCurry exhibition? Some of his images are printed in huge formats and he certainly wouldn’t get away with 1200 x 800 pixels for that. Samsung is a viable option for most photographers/Digi techs to purchase especially with a great price point for SSDs. Other NVME oems like Toshiba and Seagates NVMe have storage solutions that may not suffer from the same thermal Dynamics of the Samsung. Like any performance oriented device thermal management or upfront cooling design allow the device to operate at peak speeds to heat ratios for the greatest amount of time especially on location. As a Digi-Tech I add a USB fan to my kit to gently blow ambient air over the NVMe to sustain it’s performance. Start scaling them and you have 2-3GB/s of performance for absolutely massive file management from 100-12GiPixel sized files. As a Archive tool consider using LTO tape to maximize you shelf storage to data accumulation so you don’t end up with your closet full of HDD drives. Using NVMe to work then deliver to client before Archiving TB of images. I use 2 sets of external WD USB 3.0 drives and Alway Sync to sync the differences on the 2 sets of disks. The oldest disks are at least 5 years old and working fine. Besides the 2 disk sets I have a few other disks with extra backups. The only external drives that ever failed for me was a Samsung USB 2.0 disk and a Seagate disk many years ago. Regarding the Samsung Pro 960 M2, I had one in my computer and I didn’t have any problems with it, except using it as a boot drive on an Asus X99 Pro motherboard. Often I could not boot without going to the bios setup and selecting the Samsung disk. Not sure if it was the disk or the motherboard which had the latest bios. Read everything I could about the problem, but never got it to work reliably so ended up using it as a data disk. How about applying good conductor like thermal stick onto it ? What’s wrong with working on your PC and backing up on a NAS. Keep it as Raid 1 and that’s that. For extremes speeds, or to edit from the nas direct, Keep it as raid zero and do a nas to nas backup on a separate site. Buy raid drives and get pro versions to enjoy the 5 year warranty for a small premium of 10 -20% over non pro. Use the nvme if it speeds things up but ensure it’s warrantied. You do not tell much about your build, and why you’re not able to control the heat in your box. Apple and other notebook vendor has been using SSD’s (msata, and pci(mvme)) for some years, and they run with out any problems, I have an Retina from 2013 which gets pretty hot with 3-5 VM’s running, and the SSD is still ok.
As for security, backup is backup when you have at least one copy off site, and if you can restore your environment from that backup. Not many people have that option. Next is then using a proper backup tool, Time Machine is an option, as it’s will keep multiple copies, on multiple destinations. Then there are doubler (borg backup and what have you), most of them can save file off site (directly), google files, amazon s3, etc. can be used. I personally keep files on site (budget), but have a box (raid6) which is only being used for time machine and destination for my borg backup – I have at least 3 copies of my photos, as less is too dangerous. With USB-3 portable drives available nowadays with capacities of 2TB and more, for a pittance compared to RAID setups, I’ve found that keeping all my RAW files in one of them and using another to keep a backup and a third one for backup of backup, things are reasonably safe. I just can’t trust a SSD (not yet, anyway!) for keeping anything other than OS files, which – in principle! – can be easily reloaded via re-install. As for activation keys for all my products, they are all kept in ONE Drive and other cloud places like email providers. That way I can always reset things after a re-install. There are nmve drives destined for laptops (power&heat optimized) and there are – for raw performance. The later can get hot, but they have thermal throttling protections, and if you carefully choose manufacturer – you need to do something very stupid (like, install performance nvme drive into laptop) to fry them. As one person stated use the M.2 drives as OS storage and select another drive for data (HDD / RAID). If you use the machine for business then get a modern LTO drive for backup and put the tapes off-site. If it’s just for personal use get a second hand LTO drive off ebay or corporate liquidations. I have had two NVMe drives fail in client’s Dell computers (not that the brand matters). Dell replaced the drives under warranty, and all the data was backed up, so there was no data loss, but it is still a huge hassle to have to re-image everything. Interesting topic. I backup there and it is like $3.95/TB/mo. which makes it affordable. Set backups to run either realtime or scheduled and throttle your backups so it doesn’t consume your bandwidth during the day and let it rip in the evenings. Eventually you will have all files in the cloud with a true backup. Wasabi is eleven 9’s reliability and performance is 6 times faster than Amazon S3 type storage and much cheaper. Using cloud, you don’t have to remember to run a backup or physically swap a drive or any of that manual stuff. Plus your stuff is offsite so if you have a fire it isn’t catastrophic for your data. Dropbox and other file sync solutions are nice like others have commented, but they are not backups. Can you imagine having to go back a revision file by file when you have 100’s of thousands of files? No thanks. Admittedly I haven’t checked recently if those services have implemented a feature to go back a revision on all files at once or not. But that means if you get encrypted you better let it encrypt your whole dropbox file because if you catch it and stop it, you wouldn’t know which files to revert and if you reverted all files, you may actually lose current data which wouldn’t be good either. In fact some of the latest backup solutions have encryption detection features so they don’t backup encrypted files from a ransomware strike. This keeps your backups clean. Additionally, many of these cloud storage providers have software tools or 3rd party tools that will allow you to access your data online similar to a dropbox type solution without the ransomware risk. Cheap safe and effective…and secure. How reliable are normal SSDs (those box types)? Aaron, very reliable. I have been using regular SSDs for years, without any issues. So putting samsung evo 970 pro ssd nvme on laptop such as lenovo y530 is not good idea? Will it damage the laptop?